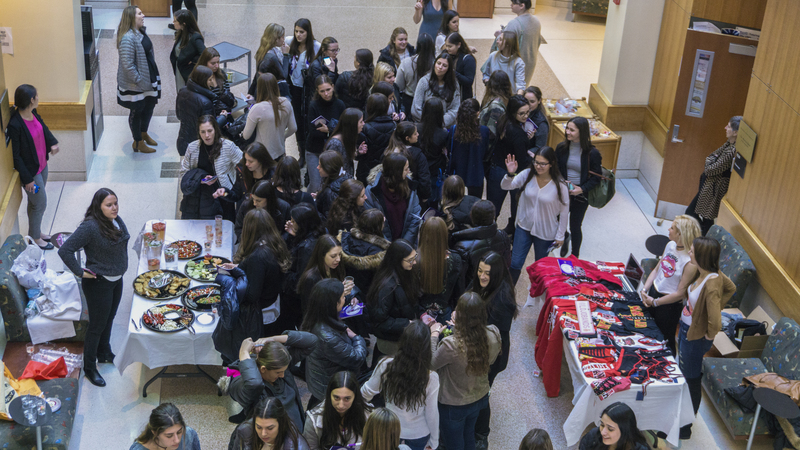 About 100 Jewish students gathered Sunday at Maryland Hillel and in Van Munching Hall’s Thomas G. Pownall Atrium for an evening of socializing and professional development at the Fourth Annual Jewish Women’s Leadership Conference. 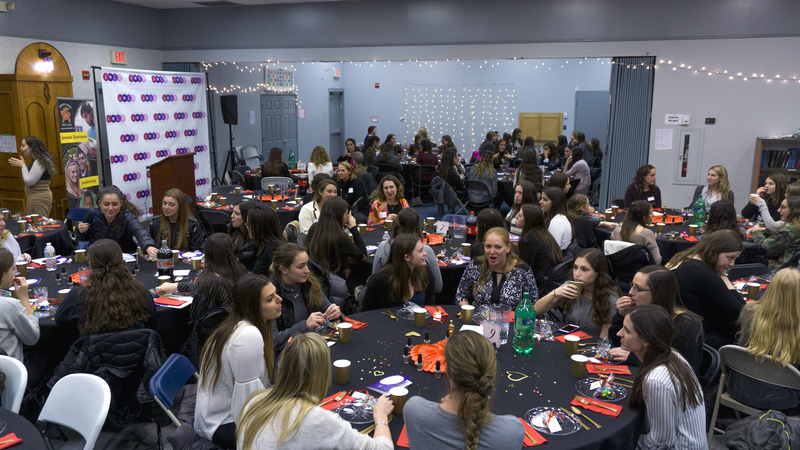 Students sit down for a networking dinner in Hillel with a variety of Jewish female professionals. Tom Hart/Mitzpeh. The conference was an opportunity for this university’s young Jewish women to acquire valuable workforce skills, incorporating their backgrounds and identities, with a sense of feminine confidence. Talia Orencel, Director of Engagement and Social Justice at Hillel, said this sort of encouragement is not emphasized enough. “We really want [the JWLC] to be an experience where the students can learn from it, feel empowered,” Orencel said. Rabbi Aderet Drucker, National Manager for the Young Women’s Leadership Network at Jewish Women International Sasha Altschuler, Smith school MBA candidate Staci Bank and Executive Director of the National Coalition Building Institute Cherie Brown held lectures and workshops. 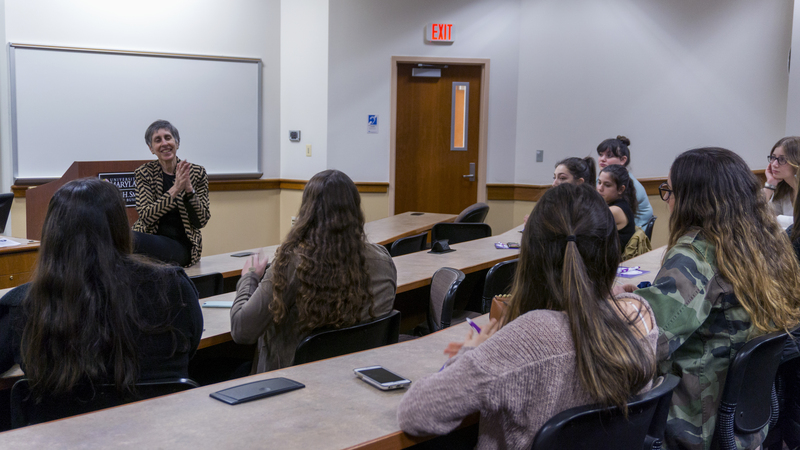 Topics included gender dynamics in the workplace, business etiquette, identifying key experiences when applying for jobs, and the perspective Jewish women can contribute when working for social justice. Executive Director of the National Coalition Building Institute Cherie Brown holds a workshop on social justice. Tom Hart/Mitzpeh. The lattermost is a new addition to the JWLC. Given that social justice is a hot topic on college campuses, Orencel said that organizers try to tailor the conference to the interests of the women who attend. Sophomore biology and Spanish major Sam Goldman, who co-chaired the event, said the emphasis on social justice asks attendees how they can take leadership beyond the workplace and have a positive impact. This shift in focus is reflected in a change in typical sponsorship. In a brochure provided at the event, a “Community Partners” section lists Support the Girls, a Wheaton, Maryland-based non-profit organization that collects bras and feminine hygiene products to be donated to homeless women and girls. The JWLC focused more on corporate sponsorship in years past, said junior community health major Raquel Weinberg. The event also included a “mocktail” hour during which non-alcoholic drinks and hors d’oeuvres were served A trunk show featured a number of local women-run small businesses selling apparel, jewelry, and a manicure service. Students gather for the trunk show and mocktail hour in Van Munching Hall. Tom Hart/Mitzpeh. Weinberg said organizers “kept a lot of the essentials the same,” including the networking dinner that featured around 20 Jewish female professionals in a variety of fields before a keynote speaker closed out the evening. Students said the opportunity to share their perspectives with women of a common identity as a reason for coming to the JWLC. “We believe every woman has the ability to lead and that they shouldn’t feel that because they’re a woman, or because they’re Jewish, or because of anything that they can’t achieve that full potential.” Goldman said. No Replies to "JWLC adapts to student interest, maintains professional aspect"